“The security check is an essential part of modern air travel,” says Dubai Airport. All major international airports worldwide cannot deny this fact. Facial recognition technology is the latest security measure in development. Dubai International Airport, one of the best and busiest airports in the world, is pacing fast to catch on to the emerging security technology. That’s why Dubai International Airport (DXB) has brainstormed a unique innovation, which no one has thought or heard of till date, for security checkpoints at all terminals. The innovation is use of on-ground tunnels with face-scanning virtual aquariums as security checkpoints. The proposed tunnel walkways leading to boarding areas will feature face-scanning aquariums on both inner sides. The aquarium of each tunnel is fitted with 80 cameras to scan faces and irises of travelers walking through the tunnel. To draw travelers’ attention, gripping images of different landscapes are on display inside the tunnels. Once travelers walk out of the tunnels, they are greeted with the message, “Have a nice trip” or they are held back by the security due to the display of a red sign. The upcoming face-scanning aquariums at Dubai International Airport will not only hide cameras but also make travelers feel good when they look around inside the tunnel so that face scans come in superior quality. The fish in aquariums is a sort of entertaining bait to catch the attention of travelers for the hidden cameras to scan their faces and irises. Not only those boarding departure flights but also those catching connecting flights at Dubai will have to walk through the tunnels with face-scanning aquariums. Notably, Dubai is the main layover for Emirates’ international flights. Nearly 7.7 million passengers transited through Dubai International Airport in December 2016 only. About 11.44 million travelers transited through Dubai on routes to India from several countries including the United States in 2016. All Dubai airports are expected to receive 124 million transit flyers in total by 2020. 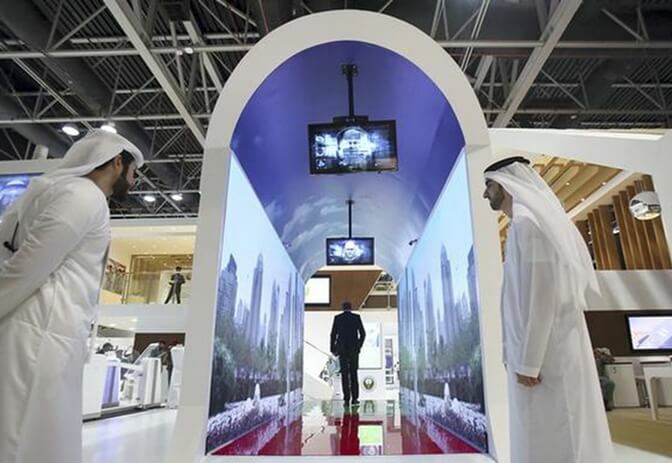 Dubai Airport is working on face-scanning tunnel walkways in partnership with Emirates Airlines whose flight tickets from USA to India are available for the lowest fare at IndianEagle.com. Emirates operates flights from Atlanta (ATL), Boston (BOS), Chicago (ORD), Dallas (DFW), Los Angeles (LAX), Las Vegas (LAS), New York (JFK), Newark (EWR), Seattle (SEA), Houston (IAH), Washington DC (IAD), and San Francisco (SFO) to India via Dubai. Terminal 3 is likely to get Dubai Airport’s first face-scanning tunnel in 2018. Other terminals will get it in phases until 2020. Not just Dubai Airport but major US airports too, including the world’s busiest Atlanta Hartsfield-Jackson International Airport are gearing up to install face scans at departure terminals. The US hit upon the idea of face-scanning security technology during the Obama regime, and the technology is under trial in the Trump administration. Atlanta, Boston, Houston, Chicago, New York JFK Airport and Washington DC Dulles Airport (IAD) will be the first US airports to put international travelers on departure flights to face scans in 2018 onwards.